COLORADO SPRINGS, Colo. (AP) Sooner or later, somebody was bound to make a long putt at the Broadmoor. 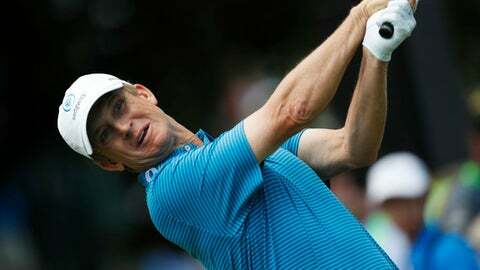 David Toms did just that Sunday – and not too much afterward was hoisting the trophy for the U.S. Senior Open. Jimenez (69) made his first long putt of the week – a 16-footer – to also birdie No. 18. Hours earlier, though, he hit his tee shot above the hole on the par-3 eighth and needed four to get down for double-bogey. Kelly, who led after each of the first three rounds, struggled with the wind and his distance control all week but stayed in it until the last shot. He shot 72 and didn’t make a putt of over 12 feet over the entire tournament. ”It always comes down to those putts,” Kelly said. ”David, he makes birdie on 16 and that par putt on 17, I had a front-row seat. I rose my putter up (to celebrate with Toms). That was just a pure putt and that’s – he’s a major champion. The way Toms locked up this major looked a lot like the way he did it for his other one – the 2001 PGA Championship. It was at Atlanta Athletic Club where his smart layup and par save on the 72nd hole helped him preserve a one-shot win over Phil Mickelson. Moments after his go-ahead birdie, his tee shot rolled to the front edge of a fairway bunker, just beneath an upcropping of grass. Toms chose to lay up, steadying his left foot on the grass, his right foot in the bunker and popping the ball out to 98 yards from the pin. His third shot landed past the cup and did not spin – leaving him the tricky downhill 20-footer that he put into the back of the cup. ”The PGA was the first thing that popped into my mind,” he said. Next, one of the champion’s biggest decisions will be how to split the caddieing payout. His son, Carter, had to take the bag Thursday and Friday after his regular caddie, Scott Gneiser, was rushed to the hospital with chest pains. Gneiser was fine and returned for the weekend. Carter, an LSU player, can hang onto his day job.